Senior Technical Assistant 9 Posts 35 Yrs M.Sc. Address: Office of registrar, university of allahabad, allahabad-211002 (u.p.). Allahabad University is seeking applicants for Data Entry Operator, Senior Technical Assistant, Assistant Librarian, Section Officer, Animal Attendant, Medical Officer on its websiteallduniv.ac.in for graduate, post graduate, m lib, 12th, bca, mbbs. . If you will be recruited , you will be posted at Uttar Pradesh. Apply on or before 19-11-2018. For specific details like age limit, pay scale,eligibility criteria read the detailed information above. 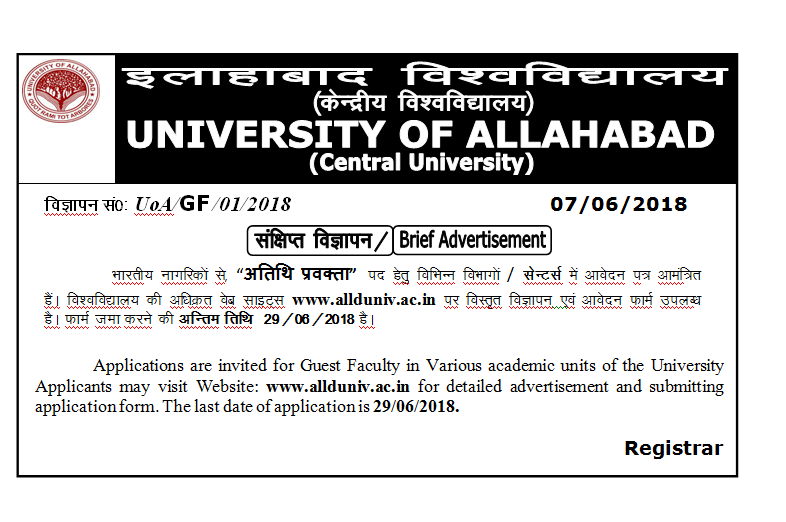 Allahabad University has uploaded a notification on their official website www.allduniv.ac.in for the posts of Guest Faculty, seeking interested and eligible applicants for post graduate. If you wish for work in Allahabad University, this can be a good opportunity to fetch a job here. The place of the job will be Uttar Pradesh. Applications completed after matching your eligibility criteria should be submitted before the deadline date that is 29-06-2018. For specific details like age limit, pay scale,eligibility criteria read the detailed information below. This entry was posted in Teaching Jobs, university jobs and tagged govt jobs for 12th, govt jobs for bca, govt jobs for graduate, govt jobs for m lib, govt jobs for mbbs, govt jobs for post graduate, govt jobs in uttar pradesh by sonam sharma. Bookmark the permalink.